Do you read Beauty411? You really should -- Nancy Houlmont is super knowledgeable about all things beauty (especially skincare), and she's just the nicest person around to boot. (You can read more about her in my First Look Fridays column here!) Nancy has the ability to get me hooked on product after product -- so many of the ones I end up loving, I first discovered on her site! 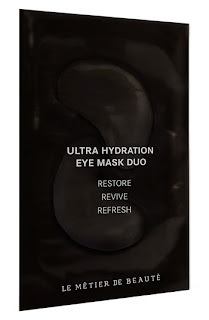 And the most recent addition to my arsenal, of course based on a glowing review from Nancy, is the Le Metier de Beaute Ultra Hydration Eye Mask Duo. These patches promise serious hydration in just 15 minutes. And I'm here to tell you that they deliver! I was immediately intrigued because I love a good sheet mask. The seaweed-based formula of this duo promises to reduce redness, diminish puffiness and hydrate the under-eye area -- plus, they're incredibly cooling. But here's my favorite part of these eye masks. They're more than just a typical sheet mask -- they're more of a gel-like consistency. They adhere to the skin upon contact and, within minutes, they start to look like a second skin. By the time 15 minutes are up, they've become so skin-like that you can't even notice them! Which makes them perfect when you're on a long flight and want a little extra hydration without people noticing your weird skincare habits. My eyes are definitely thankful that they discovered this duo. Now it doesn't matter how tired I am -- because no one has to know but me. Le Metier de Beaute Ultra Hydration Eye Mask Duo is $150 for 8 sets of patches at nordstrom.com.